Well, today was an amazing day. I was lucky enough to join the cast and crew of Black Wake for one of their last days of principal photography. Through my work at HorrorSociety.com, I’ve become acquainted with the previous efforts from the film’s director Mr. Jeremiah Kipp, such as Crestfallen, Painkiller and editions of “In Fear Of.” This film-making journey was especially interesting because it was the first time I’d get to experience the man in action, leading his well-staffed crew, minor characters and dead-like and infected extras through some intense kill scenes and pick-up shots. Before I get ahead of myself, I’d like to start from the beginning. Being that the title Black Wake is directly related to a type of waterway, obvious filming needed to take place around a gigantic body of water. 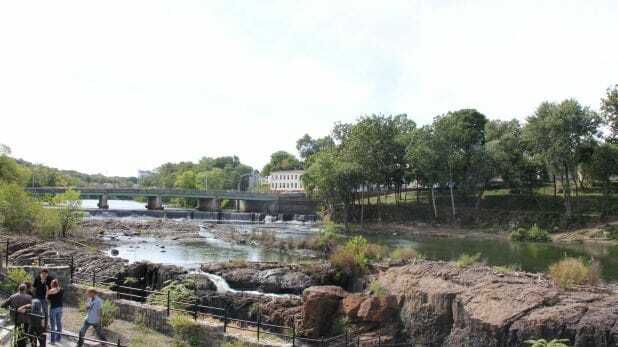 The destination for today’s filming was the historic Paterson Falls National Park. The Falls features bridges, canyons, cliffs, and of course, breathtaking waterfalls. In all honesty, I’d never been shooting on a location that grand before and I was extremely impressed. After a quick location change, also situated within the historic waterfalls, and some special effects work that were equally as impressive as the location itself, filming resumed with Mr. Memoli and other familiar faces I’ve encountered while making the rounds and working on various sets. Shout out to Patrick Devaney, Missy Heather, Nick Petito and Thomas Ryan! Scenes that were filmed at the new location included monster B-roll, an attack scene on some stairs, an attack scene on a hill and other small pieces of a larger puzzle. I couldn’t help but notice everyone working so hard to make Black Wake the best it could be, I only wish I had learned more people’s names! On the flip side, there are some extremely recognizable faces appearing in Black Wake, though, ones that you’re sure to recognize. Most of the lead and supporting cast is comprised of former Golden Globe Nominee Tom Sizemore (Black Hawk Down, Saving Private Ryan), former Oscar Nominee Eric Roberts (The Cable Guy, The Dark Knight), Anthony Marks (Airplane vs. Volcano, “One Life to Live”), Christopher Stadulis (“All My Children,” “The Following”), Brett Azar (Jersey Shore Massacre, Terminator: Genisys), Jonny Beauchamp (“Penny Dreadful”), Nana Gouvea, Rich Graff, Jeremy Fernandez, Alex Emanuel and Adam Ratcliffe. With great conviction I can say that Black Wake is one of the best film sets I’ve visited. The wheels of production were constantly turning, meaning time wasn’t wasted. The crew seemed on top of their jobs and the actors and extras on set seemed genuinely happy to be there, to help out. The location was absolutely stunning and was just a joy to be around when I wasn’t sneaking behind the frame to snap a few photos. Normally, I’d wish a film good luck as they continue with shoot dates; however, Black Wake is nearly completed so instead I’ll say this… I have a feeling it won’t be long until this baby secures a distribution deal and lands in your DVD collection. And I’m so grateful to have witnessed a piece of it in advance! Thank you to everyone for the warm welcome and for the opportunity. Keep up to date on its progress on Facebook. Black Wake is written by Jerry Janda with producer Carlos Keyes and cinematography from Kenneth Kotowski. Previous article Adam R Steigert’s S.T.A.R. [SPACE TRAVELING ALIEN REJECT] First Exclusive Images Released!